Accepta 1035 is a superior quality aqueous solution of 35% hydrogen peroxide. Hydrogen peroxide is a powerful oxidiser and is used extensively in a wide range of commercial, industrial and municipal applications. Hydrogen peroxide is a clear, colourless liquid that can be mixed with water in any proportion. 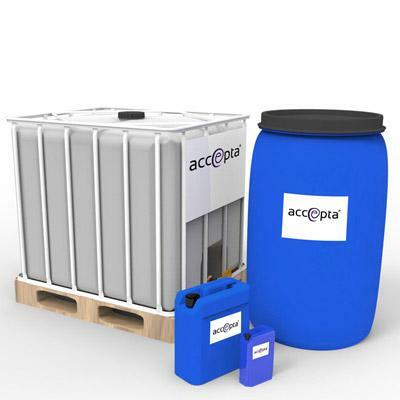 Accepta’s hydrogen peroxide is considered an environmentally friendly product, as when it decomposes the two by-products formed as a result are oxygen and water. These harmless decomposition by-products make hydrogen peroxide a preferred chemical for use in many industrial and municipal applications. Dose Accepta 1035 to suit the individual application. For further technical assistance concerning Accepta 1035 please contact Accepta technical support.